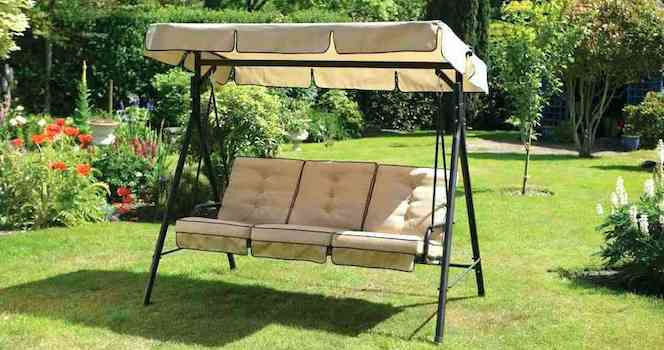 Add more life to your garden or your patio by purchasing a swing where you can relax. You'll be amazed at just how varied the options are. Choose the best deals from wooden, metal, fabric or resin swings. You are sure to find one which will definitely match the style of your home whether you prefer a canopy, garden swing chair, double swing, frame set and more. Get them at discounted rates when you stack voucher codes from Wilko, ebay, LivingSocial, Wowcher, Studio, ASDA, GoGroopie, Littlewoods, Domu and vidaXL. Enjoy a cheaper purchase using limited special offers, too. Multi Play Swing Set - Summer Fun! Double Swing & Glide - Bargain Price! Outdoor 3-Seater Swing Bench - 3 Colours! Upgrade your garden with money-saving swing deals from your favourite UK retailers! A swing is a hanging seat that is widely used not just in the UK, but also in the entire world. You get to find swings mostly on the playgrounds, circuses, or on gardens and porches. They are even used as an indoor furniture at times. There are different types of swings. There are tire swings, natural swings, rope swings, baby swings, porch swings, canopy swings, hammock swings, and tandem swings. So it doesn’t matter if you are searching for a swing for your toddler or a swing set for your garden, our group of savvy money-saving experts are here to help you on your quest to finding the best swing that will suit both your needs and budgets. From top brands such as Hedstrom, Chad Valley, Plum, HLC, TP Toys, Garden Games, Little Tikes, and Soulet, you are sure to find great deals and offers that can help you get massive discounts. Take advantage of the clearance sales and seasonal sales announcements of various trusted UK retailers like Smyths, Amazon, Argos, and Ebay posted here by our massive community of bargain hunters. Choose the best swing ideal for your needs at the comfort of your homes without having to break your bank. Don’t forget to check the amazing offers on swing that are updated on a daily basis at Latest Deals. Chad Valley Kids’ Active 2-in-1 Swing. This affordable swing is perfect for every kid. This can be enjoyed by children over 12 months of age up to 8 years old. The Chad Valley Kids’ Active 2-in-1 Swing can hold up a maximum weight of 45kg, and comes with a detachable nursery seat. This features durable powder coated steel frame to give it the extra support it needs. Hedstrom Deluxe Folding Toddler Swing. This swing specially designed for toddler use has rubber feet that makes it safe for either indoor or outdoor use. The swing features removable UV resistant fabric seat. What catches our attention is its easy folding mechanism, allowing it to be easily stored after use. Chad Valley Single Swing. Give your kids another reason to play outdoors with this Chad Valley Single Swing. This can give your little ones hours and hours of fun time while their body remains active. This swing is composed of plastic and metal, and features durable powder coated ground pegs and steel frame for additional support. Chad Valley Double Swing Set. Playing is much better when you are not alone. This double swing set from Chad Valley gives your child the ability to play alongside his or her favorite playmate or sibling. This can be a great help for your family to finally get to have the chance to bond outdoors. This swing set is not suitable for kids under 3 years of age. TP Quadpod 4 in 1 Swing. This swing has 4 switchable modes. You get to change the seat design of the swing according to your little one’s age and needs. There are mode suggestions for children aged 6 months to 12 month, over 12 months, over 2 years old, and over 3 years old. This set only requires minimal time and effort for its assembly. Kipp Swing Seat. This fab swing has a seating capacity of three people. Its outer frame is made of metal giving it the sturdy stand necessary. Kipp Swing Seat comes with comfortable thickly padded cushions, wide canopy, and is supported by two steel springs. Florida Porch Swing. This is a great addition to your garden. It comes with thick removable paddings that provide optimum comfort. The best thing about this swing is that its seating is covered with weatherproof plastic fabric. Florida Porch Swing can hold up to three. Costway Garden Swing Chair. If it’s a durable and guaranteed sturdy swing you are looking for, then this garden swing from Costway might just exceed your expectations. It comes with a back and seat cushion to provide cosiness. Its waterproof canopy is perfect for UV ray or drizzle protection. VonHaus Swing Seat with Canopy. This contemporary swing is made from easy-clean textoline. It comes with swing assembly step-by-step instructions. This swing set from VonHaus will definitely make a stunning addition to your garden. WestWood Garden Metal Swing. It only takes a few minutes to set this swing set up-that’s how easy its assembly is. This swing is guaranteed to be sturdy since it’s made from quality coated steel. A dash of style you and your backyard need. Argos. Find exciting offers on swings at Argos’ Garden Swing category and Swings, Slide And Climbing Frames category. Take advantage of Argos’ daily price rollbacks on select swing deals and take advantage of their lowest price postings. Find all of your swing essentials, from swing cover to other swing accessories, at Argos. Enjoy free UK delivery and other amazing offers. Smyths. Smyths got a thrilling selection of swings in all sizes. Get to find indoor and outdoor swing sets, and don’t miss out on Smyths’ daily price reduction on select items. Discover swing seats for as low as £6.99 from top brands like Soulet. Get to even push you money-saving game further by checking out their Clearance section. Who knows? You might just find the perfect swing you have been looking for at a super low price. Amazon. Find loads of affordable swing options and swing accessories at Amazon from top brands such as Hedstrom, Plum, HLC, TP Toys, Garden Games, Little Tikes, and more. You even get to discover swing suggestions for different age bracket. 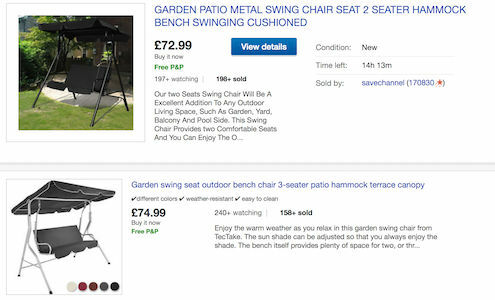 Get to own a swing seat perfect for your garden for as low as £8.99, and get to enjoy other of Amazon’s daily price cuts that can help you save over 50%. Be an Amazon Prime member and take advantage of their exclusive benefits and free shipping. Ebay. From wooden swing and slide sets to children swing seats, Ebay has a massive collection of swings that will surely amuse you. Shop with confidence and enjoy great discounts on swings of up to 41% with their price reductions. You can even filter the swing offers by the material you prefer –fabric, wood, metal, plastic, etc. Take advantage of the fast and free UK shipping on select finds. Tom’s tip: If you don’t urgently need to own a swing set just yet and you want to get massive savings on your swing purchase, wait for events such as Black Friday, Cyber Monday, Boxing Day and Holiday Sale.